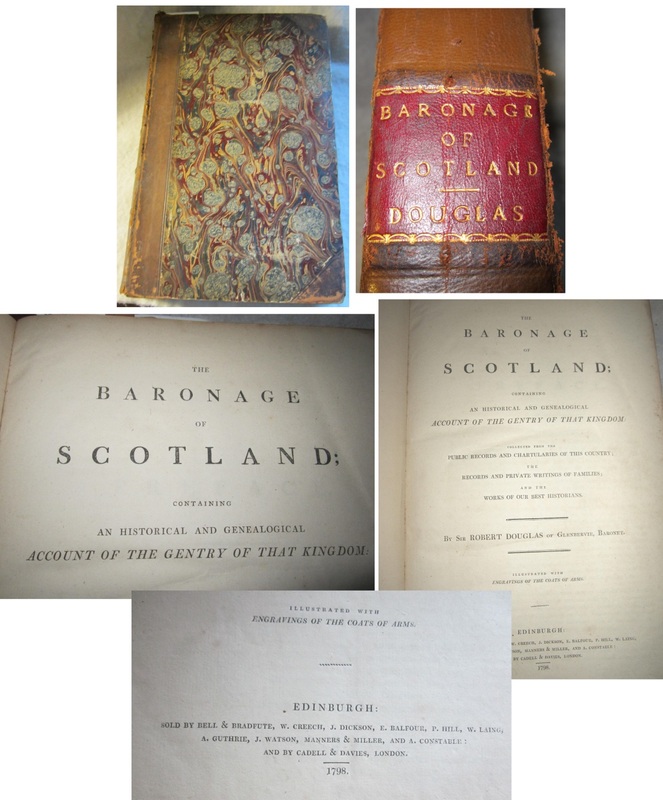 THIS LARGE 1798 THE BARONAGE OF SCOTLAND CONTAINING AN HISTORICAL AND GENEALOGICAL ACCOUNT OF THE GENTRY OF THAT KINGDOM --COLLECTED FROM THE PUBLIC RECORDS AND CHARTULARIES OF THIS COUNTRY THE RECORDS AND PRIVATE WRITINGS OF FAMILIES, AND THE WORKS OF OUR BEST HISTORIANS. BY SIR ROBERT DOUGLAS OF GLENBERVIE, BARONET ILLUSTRATED WITH ENGRAVINGS AND COATS OF ARMS, EDINBURGH 1798. - Front cover separated from book. Pages nice, but binding weakening several places.